Our bikes are garaged in a rental garage without electricity. A common situation that brings death to little used Lead Acid car and motorcycle batteries. The other day while getting something from the garage the urge to check the ZZR battery again was irresistible. Standing there with Multimeter in hand I berated myself because I had checked it only yesterday and the voltage appearing at the Solar Panel wiring inside the garage had shown only about 13.4 volts. As it was during the day I figured this voltage on charge would indicate the battery was beginning to fail as it would easily read a volt lower once it was off charge. 12.4 or even 12.5 volts for a stable terminal voltage on a charged battery tells you it has problems. Today however was a different day than yesterday. Today it was bright sunlight. Beaming sunlight. My OCD nature was having me check again what I already knew I knew, yet it was easier to give in and check it again than fight myself. The Solar Panel voltage was now reading 13.2 volts, maybe 13.3. WHAT!? With bright sunlight my voltage had fallen. Something had to be wrong here. Nothing had changed for months in the garage so the obvious thing was to check the solar panel. Sure enough, not being fixed to the garage roof in any meaningful way, the wind or a Seagull had flipped the panel over presenting its base to the sun, not the bit that does the work. With it the right way around light was now turned into electricity and my Multimeter told the picture of 13.5 volts with a steady climb as the battery took charge up to 14.4 volts. Bingo! 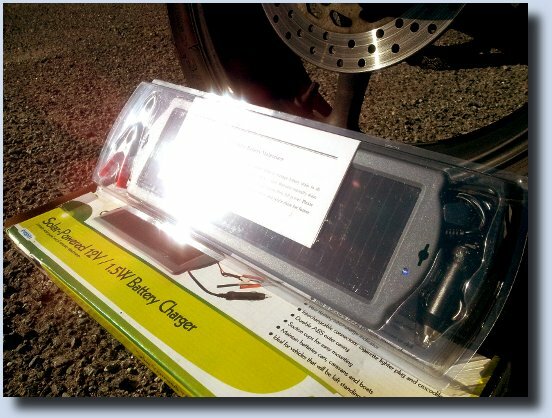 All of us who have a Motorcycle, car or boat that is infrequently used have or will soon have problems with Lead Acid Batteries. The problem is the battery ‘self discharges’ over time. I think the official figure is given as somewhere between 1% and 4% of the remaining charge per month. It also depends on temperature. As parts of the batteries plates loose their charge the plates become Sulfated and from this position they will no longer accept a charge. This lowers the capacity of the battery to do useful work. At some point the battery is no longer able to start the vehicle nor will it take a charge and the only thing its useful for now is to hold the garage door open. You’ve killed it. Everyone who I’ve spoken to who bought a mains powered ‘intelligent battery maintainer’ has within a year, bought a new battery. Usually its because the battery has gone the other way and boiled off all the electrolyte solution as ‘Intelligent’ comes in different levels where cheap and intelligent don’t usually go in the same sentence except when talking to a marketing man. The manufacturer claims on the packaging up to 86ma charge rate, and this might be about right. My analogue multimeter pulses towards 100ma reading the current. There is a visual charge indicator provided by a flashing blue LED on the side of the panel. This LED consumes power from the Solar Panel. This is where the pulse comes from. The most valuable contribution this set up provides is from nature with the sun going to bed at night. This means the battery is not on charge all the time, only during the day. Indeed a high ambient temperature gives Lead Acid batteries a higher self discharge rate in the summer, lower in the winter, and the cycle of daylight hours is indeed matched by the seasons. I’ve used this set up for what must be three or nearly four years now and so far I’ve not had a dead battery or a boiled battery. I have used it to charge some other ex UPS Sealed Lead Acid Batteries too and they are all quite happy and ready for work. The wire used to the panel is not UV stabalised and will degrade over time where exposed. Ideally this will be covered under a conduit or other protective layer, but do ensure you fit an inline fuse at the battery end as over time you can’t trust this wire. Due to this success the process is to watch Maplins. The panels normally retail at £19 but every now and then Maplins puts them on sale at £11. Of course you can get them off Ebay or similar where they might be around £13 depending on postage and packing. 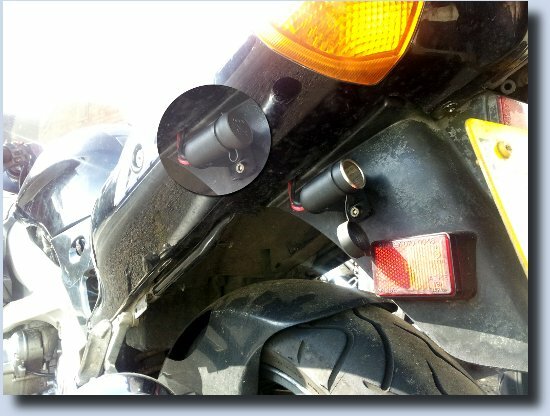 The ZZR Cigarette Lighter Socket. All fittings are Stainless Steel with Nylock shake proof nuts. I’ve installed a cigarette lighter socket with weather cap underneath the seat, mounted on the top of the rear mud guard. Its a permanent installed socket I got from the local motor accessory shop. All I have to do is plug the cigarette light plug from the solar panel into this socket and the battery maintainer is connected. There is no need to remove the seat, remove any battery protective cover, work out again which is the positive and negative leads and then clip the leads on being careful to ensure the croc-clips don’t short to the chassis. This is all the stuff you have to worry about every time you connect the charger if you don’t make the process easy for yourself by spending a few more quid on a socket and taking the time to properly install it. Don’t forget a fused lead to the socket at the battery end!. 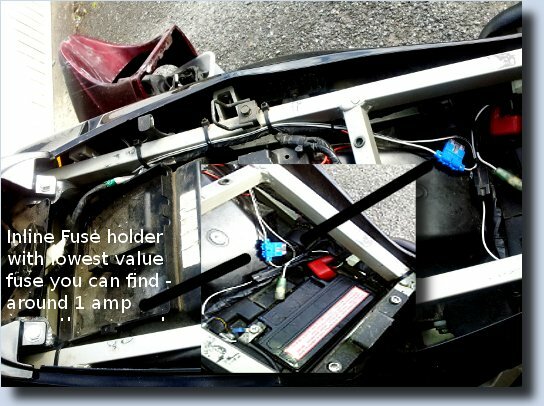 The cost of a replacement battery is around £50 for the ZZR and that was a few years ago. This project is a no brainer. You just need to decided to ‘do it now’. A rule of thumb I use is ‘never install or fit a Lead Acid Battery without first having installed or organised some way to charge it. If you don’t your setting yourself up to have to buy another battery where you need to once again to begin reading this sentence again’. So start at the end and work backwards. Install a charging system first and then install a new battery’.